Look, in principle, I am for the rule of law. But what does “the law” mean in Russia today? There is no one today in Russia--no one-- who is in business, whether a shopkeeper or the owner of an oil company, who has not made mistakes with respect to the law. As early as 1996 no one understood what taxation meant exactly. So by the letter of the law, I suppose Putin may put in jail anyone who has done business in Russia. The problem is how will he realize the application of the law. Prior to 1991 Russian society was relatively free from crime. Crime took place on the underbelly of Russian society but it rarely came into view for the average Russian or outside observer. For the average person Russia society under Soviet rule looked orderly and law-abiding. In Soviet Russia the rule of law was in fact blurry, but those who attempted to skirt the boundaries of legality knew that getting caught meant facing an unforgiving justice and penal system. Those that were arrested faced an uphill battle in a system that was heavily balanced in the state’s favour. Since the fall of the Soviet system however, the gears of justice in Russia have been slowed to a near halt by the mire of inapplicable communist era laws, an under funded legal system, and law enforcement agencies that have little power in the face of highly organized professional criminals. To compound these problems Russia has, with incredible pace, moved from a fairly closed command economy to an open-for-business market system. The state has sold off at enormous discounts vast assets in the oil, telecommunications, and mineral industries to name but a few. Rapid and often reckless privatization has led to government corruption and abuse of the system by those with the funds or power to do so. Since the fall of communism in 1991 some have had their dreams of capitalist prosperity smashed, while others have relied on less than respectable methods to attain their vast fortunes. It is under these conditions that economic crime has flourished in the new Russia. Wily entrepreneurs have taken advantage of weak institutions and those inexperienced in the cutthroat world of capitalism to fleece the country of its riches. A key component of this wave of economic crime in the new Russia is the ability of individuals to clean and hide their stolen loot in the vast world of international finance. Ordinary Russians and the massive Russian state have seen their attempts at bringing economic criminals to justice thwarted by a complex system of international finance designed with anonymity in mind. The criminally minded have used international banking, foreign trade, and weak Russian regulations to clean the proceeds of embezzlement, prostitution, drug trafficking, and the sale of (previously state owned) weapons. “Capital flight” out of Russia under Yeltsin’s presidency has been estimated at $150 billion. Western apologists for post-Soviet Russian leaders like to make the lame distinction between the problematic, but legal process of “capital flight” and the wickedly illegal practice of money laundering. Despite the avoidance of the issue by some, the practice of money laundering has flourished in Russia since the early 1990’s. Most estimates put money laundering within the Russian Federation at about $100 billion a year. Russia is clearly one of the easiest places to do one’s laundry. In this paper I hope to explain not only the practice of money laundering in the new Russia, but also the factors that allowed for its development, the international and domestic pressures that came to bear on the Russian state as a result of it, and the institutional restraints that will limit it in the future. Gustafson argues that Russian crime has reached “epidemic” proportions. He cites three factors that separate an epidemic from an endemic infection: “It strikes when society is weakened, it rapidly builds to a peak in which a large part of the population in infected, and then it subsides.” It is my thesis that Russian economic crime, specifically money laundering, has reached its peak, and will begin to subside as state institutions become stronger. The post-Soviet honeymoon is over; the international community and Russia’s domestic population is no longer content to praise Russia’s development just as long as the country is staving off communism. International governments are beginning to demand that Russian capitalism move out of its infancy and take its position in the global financial market. The Russian Federation’s response to the problem of money laundering is a prime example of the government’s willingness to answer the call and grasp hold of a better future for the Russian people. I can hide money in the twinkling of an eye from all the bloodhounds that could be put on the case, and I would be so far ahead of them that there would never be a hope of unravelling the trail. I am not kidding you. Technology today means that that sort of thing can be done through electronic means. William Mulholland, Former CEO of the Bank of Montreal. Money laundering has consistently been defined as “transforming the proceeds of crime into usable form and disguising their illegal origins.” This short and widely used definition does miss a point that has become abundantly clear since 9/11: money laundering is as much about future crimes as it is about past crimes. Financiers of terrorism understandably shy away from the public eye by hiding their support in a web of international wire transfers until the real source of the cash is buried. Individuals partake in laundering cash for one of three reasons, all of which are aimed at masking the source of the funds. The first reason is that one is attempting to hide the fact that funds originated from an illegal activity like gambling, prostitution, or the sale of drugs. A second reason one might try to hide the source is that the money is going to be used in future to fund illegal acts like terrorism; this type of laundering has received great, and arguably wasted scrutiny since the events of September 11th, 2001. A final reason one might launder money is that she wishes to avoid detection by government authorities in the country of origin, either to avoid taxation or in some instances to avoid unwarranted seizure by a corrupt state. In Russia most money laundering is aimed at either avoiding taxation, cleaning money from criminal activity, or funding terrorist organizations. Therefore, money laundering can be defined as hiding the source of financial resources, whether they be cash, stocks, or property, to either facilitate the use of proceeds of crime or mask the benefactor of a future crime. Governments around the world, and to some extent in Russia, have recognized that in fighting money laundering they are making it difficult for individuals to reap the benefits of crime, as well they ensure that their tax revenues do not slip through the cracks of a globalized financial black market. First, ‘placement’ is where large amounts of cash are negotiated into some other less obviously suspicious form.... Second, in the ‘layering’ stage, money is spread within the financial system to create a false picture of the provider of the original cash.... Third, in the ‘re-integration’ stage, the cleaned up money is brought back, supposedly legitimately, into the financial system operated by the end-user. It is imperative that one understands that these steps do not regularly take place in one city, province, or country. Each of these steps, which often comprise of numerous transactions in and of themselves, involve transferring financial resources across borders and out of the view of domestic law enforcement agencies. A general outline is given in Figure 1. -Gambling, fraud, prostitution, drugs, weapons, ect. Option 1: Cash paid into bank. Option 3: Cash used to buy high value goods, property or business assets. Option 2: Cash deposited in overseas banking system. Option 3: Resale of goods, property, or business assets. Option 1: False loan repayments or forged invoices used as cover for laundered money. Option 2: Complex web of transfers (both domestic and international) makes tracing original source virtually impossible. At least one card-based system currently being developed by Mondex, a company owned by Mastercard, is designed to allow money to be transferred directly between cards without leaving [an audit] trail. Digicash, which is developing a computer based payment system, is using what it calls a “one-way privacy” method, which allows payers to check who received money from them, but does not allow recipients to find out where it came from. Technological innovations that facilitate transactions of large sums of cash with the added feature of anonymity are a nightmare for law enforcement agencies, a nightmare that the international anti-money laundering community hopes to avoid. Having established the breadth of the money laundering problem in Russia, it is important to identify some of the characteristics of the Russian state and modern Russian society that allowed for the problem to develop to such an extent. Russia is not necessarily unusual for its money laundering, especially when compared to other less developed countries. However the Russian experience with money laundering is built upon some unique happenings. First, in the wake of the fall of the Soviet Union, Russia was completely void of any functional laws dealing with money laundering. Soviet era law regarding finance certainly did not apply to the new Russian free market. One example of the inapplicability of Soviet law to the new capitalist system came with the sprouting up of currency exchanges in Moscow in the early 1990’s, while dealing in foreign currency was still unlawful according to the old criminal code. Not until the creation of a new Russian Criminal Code which came into effect in January of 1997, was there even a law covering the laundering of cash. Before this time, Russians who hid the proceeds of crime or legitimate business from the state were doing nothing technically unlawful. The lack of any law regarding money laundering is just one example of how the cart came before the horse in the marketization of post-Soviet Russia. Once the Russian state had a law to fight the rampant money laundering taking place within its borders, another more difficult problem became apparent: The state had no law enforcement agency that could effectively implement this law. The ineffectiveness of Russia’s law enforcement agencies at keeping law and order is well documented, especially in concern to economic crime where millions of dollars are at stake and bribes are usually forthcoming. To make matters worse, putting a stop to money laundering goes beyond everyday law enforcement; it requires an extensive surveillance regime to delineate between legitimate financial transactions and those that are criminal in nature. Countries around the world have established agencies called financial intelligence units that solely deal with money laundering. These FIUs collaborate through agreements set up by international organizations like the Financial Action Task Force on Money Laundering (FATF). In 2002 Russia bowed to international pressure and set up their own FIU, the Financial Monitoring Committee (KFM), to combat money laundering. This recent creation of an FIU in Russia will be discussed at length below, but it is important to note that Russia developed as a money laundering haven because of the state’s complete inability to apply its money laundering laws. Russian and international criminals had no difficulty laundering cash because of the weakness of law enforcement agencies in Russia. Perhaps the most important factor that has led to extensive money laundering in Russia is the demand created by economic crime. As noted above, economic crime has flourished since the conception of Russia’s market economy. The oligarchs are the kings of this new practice of embezzlement and fraud, but they are by no means the only ones involved. After the great Russian fire sale that privatized formerly state owned industries in the early to mid 1990’s, many individuals lined their pockets by stripping their new possessions clean. This practice of embezzlement requires a complex money laundering scheme because without it, the Russian authorities and investors left out in the cold would soon catch up to the loot. The same applies to the less profitable small time fraud that has occurred over the last ten years: as long as the individual that has been defrauded cannot track down their money, the criminal has succeeded. With verdicts often being bought by those with the funds to do so, the criminal can reap the rewards of crime with little inconvenience. Another criminal activity that has fuelled money laundering in Russia since the early nineties is tax evasion. Even legitimate business owners that garner profits through acceptable means have used money laundering as a way to avoid doing what only the very few do in Russia: pay taxes. Many Russian business owners do not understand the importance of paying taxes to a state that cannot provide protection from criminal elements or offer some semblance of social services. On all fronts, the demand for money laundering apparatuses is strong in Russia. The FATF has decided to recommend the application of additional countermeasures (including the possibility of enhanced surveillance and reporting of financial transactions and other relevant actions) as of 30 September 2001 with respect to Nauru, the Philippines and Russia, unless their governments enact significant legislation which addresses identified money laundering concerns. The FATF hopes that these countries will enact legal reforms to which they are committed so that they can avoid countermeasures. Russia faces a unique challenge in combating money laundering as it continues its transition to a market economy. The existence of continued large scale capital flight, underdeveloped market institutions and lack of fiscal resources all complicate the fight against money laundering. This recognition of Russia’s unique situation perhaps tempered the FATF’s warnings prior to 2001. It did not, however, stop the organization from putting Russia on its black list of “Non-Cooperative Countries and Territories” (NCCT). Russia was on the list from its creation in 2000 up until the Russian state made enough substantial changes to limit money laundering in 2002 to finally be removed. The Russian Government had replied to enormous international pressure by putting their regulatory house in order. We have the obvious one’s of siphoning money off from the treasury and of slowing down needed restructuring of industry, but also a more subtle effect of blocking the ambition to establish enforceable rules of the game. Since capital flight involves illegal transactions, it will reinforce old patterns of personalized relations, based on trust that neither part will turn to the authorities. And it will feed traditional patterns of high-level corruption. Added to Hedlunds economic argument is the fact that money laundering is an attempt to clean the profits of often despicable crimes like prostitution and drug trafficking. In 2000 the Russian people went to the polls and sent a message; in Putin, they elected a president that was seen as willing to stand up and fight the epidemic of Russian crime. Putin and others in government have recognized that money laundering is a large component of the crime epidemic, and have thus begun to fight it with all means at their disposal. Russia is prepared to join with Europe in fighting illegal financing and networks that sustain terrorists. Criminal Means.” This law brings the Russian financial sector in line with the regulatory standards present in FATF member countries. It established identification requirements for those involved in financial transactions, created a Russian FIU as mentioned above, set a standard for the reporting of all transactions over 600 000 rubles, and laid out a framework for the sharing of information with other FIUs around the world. The creation of a Russian FIU is one of the most important moves the Russian state could make in eliminating economic crime. It is a clear signal that in Russia, individuals will no longer easily reap the benefits of crime. Obviously, the KFM will not be able to track all shady transactions within the Russian Federation. However, some individuals will be caught attempting to make their criminal proceeds clean, in fact, some have already been caught. This alone gives the Russian market some semblance of stability and respectability. Even in Western countries with highly sophisticated surveillance regimes, like Canada and the United States, the proceeds of crime often seep through the system. Some have criticized the new Russian surveillance regime as casting to wide a net over the Russian economy, and thus becoming drowned in a mass of information. With modern data collection technology however, it should be possible for a transaction to be logged into the system, checked against a predetermined list of suspicious criteria, and cross referenced with other data, all without human intervention. The creation of a Russian FIU and a strong law on the reporting of large transactions is a vital step in combating the epidemic of Russian economic crime. Given the global nature of sophisticated money laundering schemes, the sharing of information between FIUs is very important. Russia’s FIU, the Financial Monitoring Committee (KFM), has been granted membership in one international anti-money laundering organization of significance so far, that being the Egmont Group of Financial Intelligence Units. The KFM is showing its eagerness in cleaning up the image of the Russian financial system and gaining the approval of governments around the world; in March of 2003, only months after being taken off the FATF black list, the KFM began creating their own black list on the orders of Prime Minister Kasyanov. It appears that this creation of a black list is lip service to the international community. Whether it is or not, other efforts in international cooperation will be key to making the KFM successful. Other FIUs around the world will be able to judge the KFM’s effectiveness based on the quality of information it shares. International cooperation, and thus international scrutiny, will perhaps save the KFM from going down the same path as so many other Russian law enforcement agencies and turning into an organization of bribery and corruption. The international community is keenly watching the KFM; it is this international scrutiny of Russia’s anti-money laundering regime that will ultimately create an effective counter to economic crime in Russia. Sure it’s all true. But my children will be honest. The last decade has been one of turmoil and instability for the Russian economy, government, and people. The Russian Federation was born out of a communist state that hardly resembled its offspring. During the period of rapid markertization and privatization in the early to mid 1990’s, a problematic epidemic of economic crime developed. Russia was poor and its people were weak and susceptible to the sicknesses of fraud and embezzlement. It was under these conditions that Russia developed as a top class money laundering haven. By the end of the twenty-first century as much as $100 billion was being laundered in Russia every year. 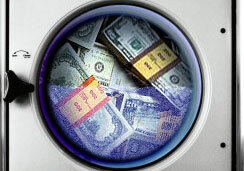 International scrutiny and the threat of countermeasures led the Russian government to acknowledge the money laundering problem and create its own anti-money laundering regulations. It appears that these measures are a step in the right direction for the Russian economy and thus, the Russian people. The creation of strong Russian anti-money laundering laws and a distinct and sufficiently funded FIU sends the message to criminals that the Russian state is taking the problem of money laundering seriously. The question that remains is whether the anti-money laundering medicine will take. Will the epidemic of economic crime be brought under control through the tough medicine administered by the Russian state? Bivens, Matt. “Laundering Yeltsin.” Nation 269 (October 1999): 11-14. Capitalism. Canada: Doubleday Canada, 2000. “Dodging the Russian Bullet.” Economist 352 (September 1999): 36-37. “Don’t Bank On It.” Economist 361 (October 2001): 73. “Fighting the Dirt.” Economist 359 (June 2001): 66-67. “The Financial Frontline.” Economist 361 (October 2001): 68-69. Hedlund, Stefan. Russia’s “Market” Economy: A Bad Case of Predatory Capitalism. London: University College London Press, 1999. Hosenball, Mark, and Bill Powell. “The Russian Money Chase.” Newsweek 135 (February 2000): 42-43. Komisar, Lucy. “After Dirty Air, Dirty Money.” The Nation 272 (June 2001): 16-19. _____. “Fool Me Twice.” Progressive 63 (December 1999): 36-39.
and Social Science 582 (July 2002): 181-94. Mariana Kurkchiyan. New Statesman 129 (November 2000): 46-51. 1996. Portland: Sussex Academic Press, 1997. Naylor, R.T. Fast Money and the Politics of Debt. Montreal: Black Rose Books, 1994. “Next Cyberlaundering?” Economist 344 (July 1997): 21. “Putin: Russia to Help Europe to Cut Terrorist Funds.” ABC News. 28 May 2002. “Red Ink, Redder Faces.” The Economist 352 (September 1999): 83-84. Effectiveness of Anti-Money Laundering Measures, 2000.” 22 June 2000. <http://www1.oecd.org/fatf/pdf/NCCT2000_en.pdf> (25 March 2003). Effectiveness of Anti-Money Laundering Measures, 2002.” 21 June 2002. “Robbing Russia.” The Nation 269 (October 1999): 4-5. Homepage. 8 December 2000. <http://www.laundryman.u-net.com/page6_mlmeth.html> (22 February 2003). Suter, Keith. “Money Laundering.” Contemporary Review 280(June 2002): 361-65. “Will Putin Put Me In Jail?” New Perspectives Quarterly 17 (2000): 47-48. “Will Putin Put Me In Jail?”, New Perspectives Quarterly 17 (2000): 48. “Robbing Russia,” The Nation 269 (October 1999): 5. Thane Gustafson, Capitalism Russian-Style, (New York: Cambridge University Press, 1999), 136. R.T. Naylor, Fast Money and the Politics of Debt, (Montreal: Black Rose Books, 1994), 12. Eduardo Aninat, Daniel Hardy, and R. Barry Johnston, “Combating Money Laundering and the Financing of Terrorism,” Finance and Development 39, no.3 (2002): 44. Keith Suter, “Money Laundering,” Contemporary Review 280 (June 2002): 362. Adapted from Billy Steel, “Money Laundering—Money Laundering Methods,” Billy’s Money Laundering Homepage, 8 December 2000, <http://www.laundryman.u-net.com/page6_mlmeth.html> (22 March 2003). Stefan Hedlund, Russia’s Market Economy: A Bad Case of Predatory Capitalism, (London: University College London Press, 1999), 351. Billy Steel, “Money Laundering--The Future,” Billy’s Money Laundering Homepage, 8 December 2000, <http://www.laundryman.u-net.com/page13_future.html> (22 March 2003). “Next, Cyberlaundering?”, Economist, 26 July 1997, 21. “Financial Action Task Force on Money Laundering 2000-2001 Report Released,” 22 June 2001, <http://www1.oecd.org/fatf/pdf/PR-20010622_en.pdf> (25 March 2003). of Anti-Money Laundering Measures, 2000,” 22 June 2000, <http://www1.oecd.org/fatf/pdf/NCCT2000_en.pdf> (25 March 2003). Hedlund, Russia’s “Market” Economy, 351. “Putin: Russia to Help Europe to Cut Terrorist Funds,” ABC News, 28 May 2002, <https://wm2.uvic.ca/MBX/jordsief/ATT:IMAP:63/4/FMC%20and%20Terrorism.doc> (22 March 2003). of Anti-Money Laundering Measures, 2002,” 21 June 2002, <http://www1.oecd.org/fatf/pdf/NCCT2002_en.pdf> (25 March 2003).